"Son, is that what you want to do?" That was the question his mother asked him the day he came home from the Oak Hill school in the Van’s Branch community of Pickett County and announced that he was going to quit school. She didn’t seem upset by what he told her, nor did she respond with something like, "Oh you are, are you! We’ll just see about that!" She was very calm in spite of the news her son had just told her. It was March or April of that particular year, and school was almost over with, but he had lost interest, and didn’t want to go back. However, by the time school started again the next fall, he was there, even though he had to take the fifth grade over again. The name of this young man is Billy Joe Holt, and in November of 2008, he was recognized for 50 years of service as a pharmacist at the annual alumni weekend of the University of Tennessee School of Pharmacy held at the Marriott Hotel in Knoxville. Quite an accomplishment for someone who planned at one time to be a fifth grade drop out. Billy Joe is the son of the late Joe Holt and wife Ona (Dennis) Holt of Pickett County. He grew up as the only boy in a family of four sisters whose names are Juanita Moody; Oleta Barber; Marilyn Johnson; and Ruby Huddleston. Another brother, Johnny Leon, died from complications of pneumonia prior to his first birthday. The farm house built by Joe Holt for his family in the Van’s Branch community had four rooms and a loft area upstairs where the children would often sleep. The front room of the house also served as a bedroom. The cooking was done on a wood stove in the kitchen. Billy Joe remembers when they moved into this house, a horse and wagon was used to haul their belongings. In time, rooms were added on to the house, enlarging it to three bedrooms, and running water and indoor plumbing was installed. Joe Holt was a farmer, did logging work, and was a partner in a saw mill while his children were growing up. It was important to both Joe and Ona Holt that each of their children grow up to be hard working, responsible adults. Many times, the plowing of the garden and the fields where the crops were to be planted was the job of Billy Joe and Juanita, a job they did side by side. The Holt family raised corn, hay, and tobacco in addition to a big garden every year. Everyone in the family had certain chores they did. Planting a garden was always a family affair. Going barefoot would sometimes last until November for the Holt children. That month was usually the beginning of winter, and the time new shoes would be bought for them. Being the only boy in a house full of girls often meant that Billy Joe was included when paper dolls were cut out of catalogues, and scrapes of material were cut up to make quilts. 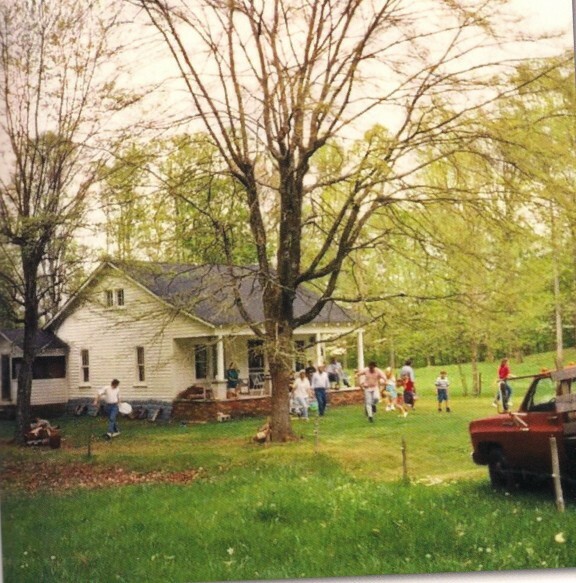 The homeplace of Joe and Ona Holt in Pickett County was always the gathering place for all the Holt family members until it was intentionally burned to the ground. The identity of the person or persons responsible was never determined. Before daylight every single morning, Ona Holt cooked a big breakfast for her family. After sunrise, some of the chores Billy Joe did each day included feeding the livestock and carrying water from the spring which was around 50 yards down a hill from the house. After completing the seventh grade at Oak Hill, Billy Joe went to Byrdstown to attend the eighth grade, and then went on to graduate from Pickett County High School in 1954. During his sophomore year, he accompanied Charles Keisling, son of Roy and Clarice Keisling, to Kansas City, Missouri where Charles received an American Farmer Award after being nominated by the State Future Farmers organization. Billy Joe’s dad drove him to the Parkway Restaurant in Livingston to meet up with Charles. The trip to Kansas City was made in Charles’ 1938 Pontiac, and of course, this was long before interstates had come into being. Between his junior and senior year, Billy Joe and a fellow classmate named Frank Riley decided to look for work that summer in Indiana. They hitched a ride with Randall Dyer who was taking a load of lumber that way. They got jobs at a Firestone plant in New Castle, Indiana making $1.20 per hour. They made a couple of trips back home during the summer they spent working in New Castle, but only if they could hitch a ride with someone coming back this way. After graduating in 1954, Billy Joe got a job at Byrds Manufacturing, a shirt factory in Byrdstown. He told me two of the best things in his life happened to him while he worked there. The first was meeting his wife and sole mate for life, Elizabeth Lee, or Liz as everyone knows her, and the second was the experience of working in a shirt factory where he soon learned that no matter how hard he tried, nothing he ever did was right as far as the women he worked with was concerned. The first job he had was in the maintenance department where he saw to the setting up of the sewing machines and making sure they were operating right. That’s where he first laid eyes on Liz. She was waiting to begin working the day some new machines arrived. Billy Joe was helping to unload these machines, and as he walked past Liz, he made the statement to her that he was "gonna put her to work." But he did more than just put her to work. Later, while showing her how to operate the sewing machine, a large amount of oil leaked out all over the pretty, lilac colored, gathered skirt she had on. After Liz realized what had happened to her skirt, she was just a bit upset, and told Billy Joe in no uncertain terms, "You’ll pay for this!" Billy Joe laughed when he told me that to this day, he still hasn’t got that debt paid off ! 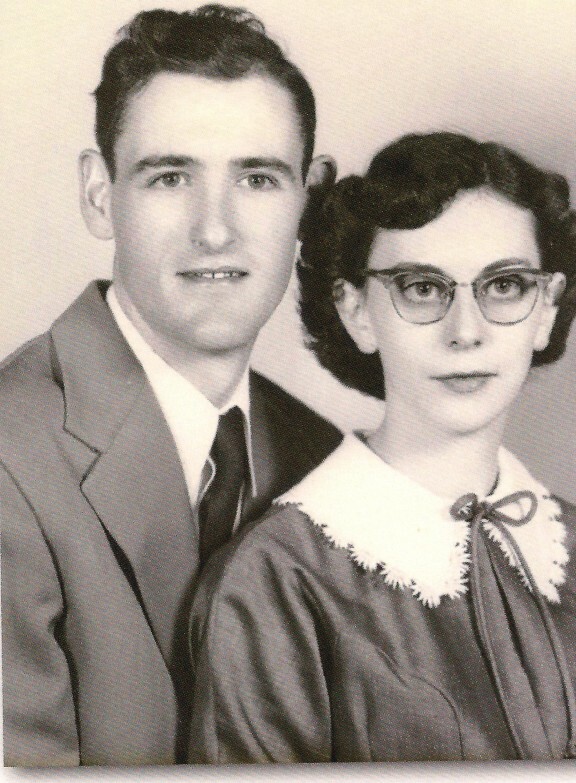 Billy Joe Holt and wife Elizabeth are shown here in the early years of their marriage. Even though Billy Joe was initially trained to be a machine mechanic, he eventually was switched over to a job as a bundle boy, and that was the turning point in his career as a shirt factory employee. He said even though he gave the job 100%, he just couldn’t take never being able to do what the women he worked with considered was the right thing. That’s when he decided he began to make plans to go on to college. He told me those women simply drove him to quit that job. In the meantime though, he had his eye on the girl who ended up with the big, oily spot on her pretty lilac skirt the first day he saw her. After asking her for a date when he later saw her on the square in Albany, she said no. It was a Saturday night, and Liz was driving a 1953 Ford, but when Billy Joe, who was with another fellow, asked her to get in with them and ride around, she turned him down. Not to be discouraged, he and his friend followed her most of the way home that night, some eight miles from Albany. Finally after two or three weeks, he was successful in talking Liz into going out with him. Liz is the daughter of the late Robert Lee and wife Ora (Polston) Lee. Her father was a tenant farmer on the Cumberland River and later, he took a job helping with the construction of Wolf Creek dam. It was with her father’s help that Liz was able to buy the 1953 Ford. Her job at the Byrdstown shirt factory helped to make a car payment to the bank, buy gas for the car, and have a little left over at the end of each pay day. And to help with the expenses, she also hauled riders to work at the shirt factory. Because of the influence of one of Billy Joe’s friends, a young man named Paul Booher, he decided to enroll in a pre-pharmacy class at Tennessee Tech. It was a one year course, but after completing the necessary paper work to enroll, Paul learned that he had not completed the necessary courses in high school to enroll. Billy Joe went ahead and completed the one year class, and then made plans to enroll at the University of Tennessee School of Pharmacy in Memphis the following September. This followed a courtship with Liz of some 15 months, and shortly before time to begin classes in Memphis, the young couple got married. The date was September 17, 1955, Liz’s father’s birthday. After the wedding, they loaded all their belongings in Liz’s car and headed out for Memphis. It was an 8-1/2 hour trip and again, no interstate highway to travel on. After arriving in the big city of Memphis, and not having any idea how to get around, much less where to begin looking for a place to live, they managed somehow to locate the school where Billy Joe would be attending. From there, they began their search for a suitable apartment. As luck would have it, and just before it got too dark to find their way around, they came across a sign that read "Apartment For Rent" in the yard of an older, historic type home not too far from the school. After inquiring, they learned from the owners that the apartment consisted of two furnished rooms and rented for $50.00 per month. Use of the one bathroom in the home would have to be shared. The furniture in the apartment consisted of a couch, a chair, two end tables, a small table and chairs in the kitchenette, and a chest of drawers that was in the kitchen too. That was where the young couple made their home for the next three years. The owners, John and Ora Sides, turned out to be substitute parents, especially for Liz, during the time they lived there. At one point later when Billy Joe was discouraged and thinking of just quitting school, it was Mr. Sides who encouraged him to hang in there, telling him things would get better. And he was right. Things did get better. For quite some time after moving to Memphis, Liz still did not feel comfortable driving in such a big city. The school was close enough for Billy Joe to walk when the weather was good, but one day after he forgot one of his books, he called Liz from school and asked if she would get in the car and bring the book to him. At first, she refused, but after some persuasion, she reluctantly agreed to try. She told me she was scared to death, but she made it okay. That’s all it took to break the ice. After that day, she began taking Mrs. Sides on shopping trips, and soon learned her way around in the city. Liz got her first job at a drop off station for a dry cleaning business where she worked part-time for fifty cents an hour. It was after Billy Joe completed his first quarter of classes that he found a part-time job working as a pharmacy tech at Bailey’s Drug Store. But this establishment wasn’t just a place to get a prescription filled. Folks could also pay their utility bills there. Shortly after Billy Joe began working there, a job in the soda fountain became available, and Liz took that job making .75 cents an hour. Billy Joe caught a street car from school to the drug store, and in the evenings, he and Liz would ride back to their apartment together. Ironically, Mr. Bailey was recognized for his fifty years of service as a pharmacist while Billy Joe worked for him. Later, Liz got a much better paying job at a blue jean factory where she was paid minimum wage of $1.20 per hour, and eventually, Billy Joe moved on to another job as a pharmacy tech with LaBelle Pharmacy in Memphis. June 5, 1958, was graduation day from pharmacy school for Billy Joe, and on July 1st that same year, a baby girl became their first born. Their daughter, Mary Jo, was born that day at Baptist Hospital in Memphis. It wasn’t long until the Holt family found themselves living in an apartment in Jamestown after Billy Joe landed his first job as a pharmacist with Reagan’s Drug Store. He started work there in August of 1958, and continued until May of the next year, when he learned of a job with Clarence Davis in Livingston. He was hired by Clarence in May of 1959. The Holt family made their first home in Livingston on College Street. By this time, their son, David, born in 1961, had been added to the family. In 1960, they bought a home on Spring Street from John Ringley and wife where they lived until building their home on Volunteer Drive in Livingston that they moved into in 1972. When the time came for Clarence Davis to retire, he sold his interest in the drug store to Billy Joe, and the business name was changed from Davis and Norris to Holt and Norris Pharmacy. Dr. Denton Norris was the other partner in the business. The business was eventually relocated to West Main Street following the construction of a new building. Following Dr. Norris’ accidental death in the mid 1980's, Billy Joe bought his interest in the business, and the name was once more changed, this time to Holt’s Family Pharmacy. Following in her father’s footsteps, and after graduating from pharmacy school, Mary Jo Holt, who was by this time the wife of Wayne Ramsey, son of Castle and Joyce Ramsey, graduated from Mercer School of Pharmacy in Atlanta. In 1986, she joined forces with her father, and they have worked side by side for more than 20 years now. Mary Jo and Wayne are the parents of two children, C.J. and Jayce. But it seems the Holt’s son, David, leaned more toward the ways of his grandparents on both sides of the family when it came to making a living. His interest has always been in farming. When he was in high school, he helped out on the dairy farm of Hugh and Doris Elder, and later, decided to go into the dairy business for himself. David married Donna Jolly, the daughter of Mary Belle (Copeland) Jolly and the late Dr. Jim Jolly, DVM. He milked dairy cows for many years, but two years ago, sold those cows, and is now involved in the registered Angus cattle business. David and Donna have two sons, Levi and Lucas. Liz was always involved with the running of their business, and spent many years working behind the counter. She is an avid quilter, gardener, raises beautiful flowers every summer, and helps out with their grandchildren. She’s quite talented in embroidery and cross stitch work, and even has her own quilting room in their home where she spends many hours putting together some beautiful and priceless creations. A really big smile spreads across the face of her husband when he explains that Liz has been awarded a "P.H.T. degree" for all her hard work in their younger years. By way of explanation, P.H.T. stands for "Putting Hubbie Through." We all know that time has a way of changing things, as West Main Street in Livingston will now attest to. When night falls on that end of town, bright red letters that spell out the name of a new business stand out against the night sky. September 3, 2008, was the day the Holt business was sold to the new guys in town, Walgreens. Thus began a new chapter in the lives of the Holt family. Billy Joe continues on as a part-time employee, while Mary Jo is also employed as a pharmacist there. Even though changes are always inevitable, there’s always a sadness that goes along with the closing of a long time, family oriented business. The home folks atmosphere is very much missed today by the customers who have stuck by the Holt family over the years. Long before the beginning of some drug stores that are now open twenty-four hours for the filling of emergency prescriptions, customers of the Holts knew Billy Joe would come in after hours to make sure a sick child or other family member got the medication needed without having to wait until the store opened the next day. Many of those same customers go back to the days when Clarence Davis not only filled prescriptions, but sold veterinarian supplies and gave advice to farmers who had sick animals. While we may enjoy shopping in a new place with what seems like endless isles of just about any item imaginable, it just won’t be the same. We liked and will miss the personal touch that came with doing business with those familiar home town faces, especially the one who was almost a fifth grade drop out.